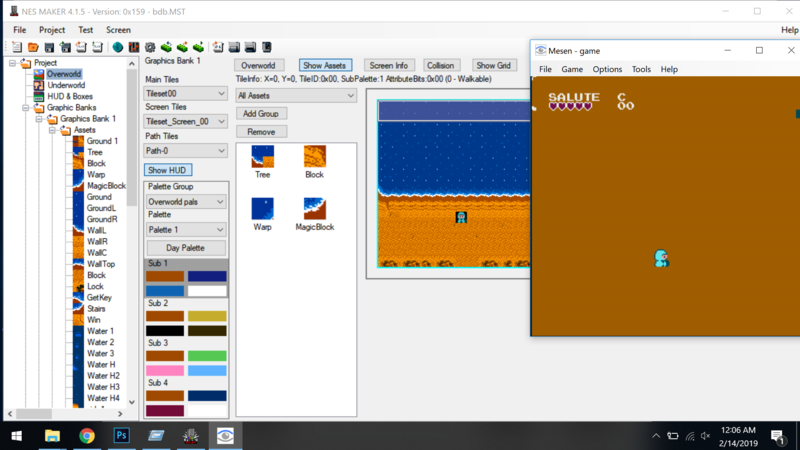 I have tried switching custom tileset with default tilesets and they do show up, so I suspect it's a file format problem. How do you export tilesets? Don’t forget, the tile (in your GameObjectTileset) needs to be a non-transparent color. Have you confirmed you have all the graphics contain only red blue green and black pixels? There's a button in the pixel editor to identify bad pixels. My guess is you imported the bitmap for your tileset, but didn't convert them to use color indexing and pallets. After converting it to a format NESmaker will use the saved bmp should be a garish Red/Green/Blue/Black image if you look at it in photoshop. Which are the exact steps to do it? I've saved it as indexed bmp in PS, opened it in pixel editor and resaved as bmp. You have to set your tileset graphics in R, G, B and black. In the pixel editor there are tools to replace the colors... cf the pixel editor tutorial video. Sorry, I didn't mean the bmp needed to be saved as an indexed bmp. The NES doesn't actually use texture files, it's graphics are just a list of pixels with one of four possilbe values, filtered through one of four pallets. NESmaker does read a bmp file and convert it into these list of values the NES actually uses. But it'll only convert pixels that are (0,0,0)-black, (255,0,0)-red, (0,255,0)-green, and (0,0,255)-blue, any values that isn't one of those 4 colors isn't coverted when built. Listen to dale_coop, and watch the pixel editor tutorial video. Specifically this part shows taking a full color graphic and converting it to something NESmaker can build.